Earth Fire Water art exhibit will be on display at the SLO Museum of Art from Aug. 3 to Sept. 30. An opening reception with the artists will be held Aug. 3 from 6 to 9 p.m. during Art After Dark. Visit sloma.org for more information. Every year, artist Kate Froman makes sure to plant some milkweed in her garden, that way all the local wannabe butterflies have a nice spot to rest and grow in. "As vacant lots decrease, there are fewer spaces for caterpillars to turn into butterflies," Froman said. PASSING THROUGH Kate Froman's silk piece, Butterfly Rest Stop, is suggestive of the colors and shapes of butterfly wings and speaks to the need for more natural, open spaces for animal habitats. This summer Froman and her fellow artists in the Central Coast Craftmakers Association turned their focus to the elements and the destruction they leave in their wake: diminishing natural resources, wild fires, drought, and more in the Earth Fire Water art show, on display at the San Luis Obispo Museum of Art from Aug. 3 to Sept. 30. "There's a wide interpretation, and I think earth and fire are on a lot of people's mind's right now," Froman said. Bob Nichols, show juror, art professor at Allan Hancock College, and one of the founding members of the association, said the show asks viewers to examine their own actions and how they impact the environment. 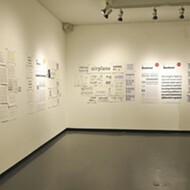 "This exhibit, based on a modification of the traditional concepts of earth, air, fire, and water calls upon us to reflect on the considerable impact of climate variations and the vulnerabilities we face as we collectively migrate further into the countryside," Nichols said in his juror's statement. "The chosen pieces reflect artistic responses to these concepts. They call upon each of us to be attentive in our decision-making and thoughtful in our use of resources." UPCYCLED Rather than buy new materials for art projects, SLO artist M'Lou Mayo is trying to use what she already has, like this trove of old zippers that turned into the piece Zipper di Duda. 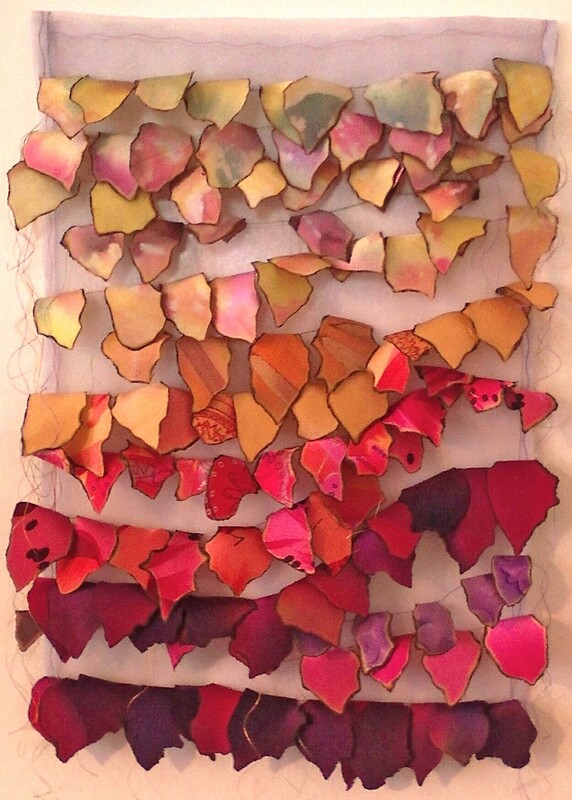 While the Earth Fire Water show includes pieces made of leaves, yarn, ceramics, steel, paper, glass, copper, and zippers, Froman works with fibers in her artwork. She started sewing as a child and then progressed to making quilts as an adult, but ran into a problem. "One can only have so many quilts, so one starts working smaller," Froman said. Over the years, Froman's fiber pieces have progressed from being utilitarian to artistic in nature. Her silk piece, Butterfly Rest Stop, is suggestive of the colors and shapes of butterfly wings and serves as homage to her practice of making sure there's some milkweed growing for caterpillars to become butterflies in. 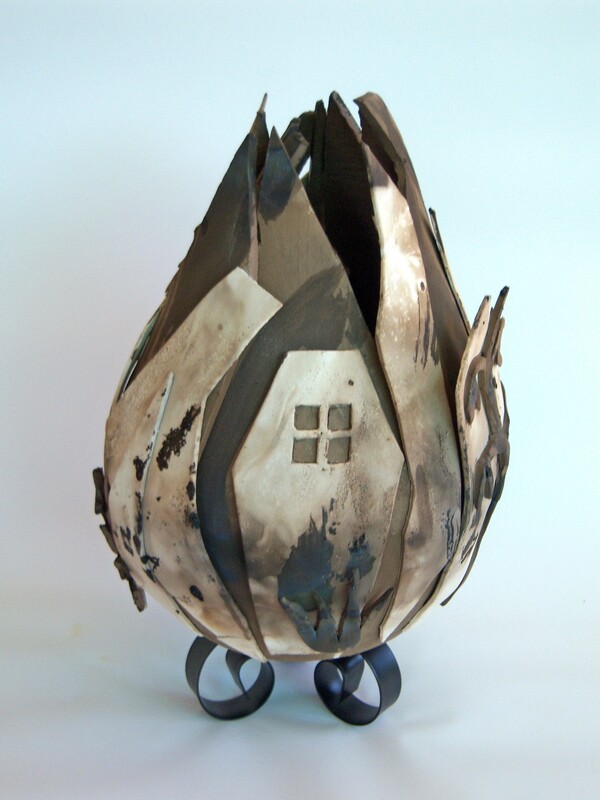 While Froman's piece speaks of growth and life, Rebecca Wamsley's ceramic and steel sculpture, Aftermath, is reminiscent of the charred remains of a home after a fire, with the front windows still intact. CATASTROPHIC Rebecca Wamsley's ceramic and steel sculpture, Aftermath, is reminiscent of the charred remains of a home after a fire. Other pieces, like Zipper di Duda by M'Lou Mayo, encourage us to reconsider our definition of art. 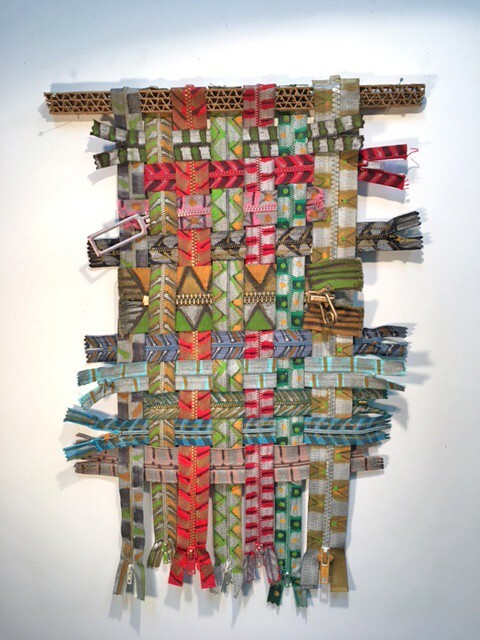 The multicolored piece is made entirely of old zippers stitched together. "I thought it was very clever," Froman said. "A lot of artists I know are working with supplies they've gathered over the last 30 years. It sets a certain challenge: What can I do with this? Having some boundaries is always very helpful for an artist." While art aficionados may come to the multimedia show looking for one thing, Froman say they may be surprised by what pieces call to them. Writer Ryah Cooley is a fire sign. Send comments to rcooley@newtimesslo.com.